Windows and HTC - a match made in heaven? In the immortal words of Taylor Swift, while the haters gonna hate, hate, hate, hate, hate, hate, hate, we're just gonna shake, shake, shake, shake, shake it off. 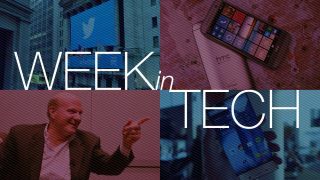 It's like we've got this music in our mind, singing "Week in tech! Week in tech!" And what a week it's been: we've seen Windows make a new friend and lose one of its biggest cheerleaders, Sharp banish the bezel, more iPhone 6 leaks than you can shake a stick at and yet more unpleasantness on Twitter. Not only that, but it's all happened while we've been dancing round our desks. The excellent HTC One M8 was our favourite phone of 2014 - but would we still love it if HTC ripped out the Android operating system and stuck Windows Phone in there instead? Marc Flores knows: he's reviewed the HTC One M8 for Windows Phone. The hardware's as nice as ever, of course, and while Windows Phone 8.1 isn't quite there apps-wise it's still a pleasant place to spend time. It's US-only for now but may roll out to other countries if it sells well. Could the Sharp Aquos Crystal be the best-looking phone in the world today? Its bezel-free design is certainly striking and fantastically futuristic, but as Joe Osborne reports its lovely looks don't compensate for what's ultimately a budget Android handset. The price is OK but it "feels hollow" and the plastic screen doesn't feel as good as it looks. "What's this? A premium design in a small body with cutting edge specs?" asks Simon Hill. Yep, it's the Samsung Galaxy Alpha. Hill also sees how the Samsung Galaxy Alpha holds up vs the iPhone 5S and Sony Xperia Z1 Compact, its key rivals. The verdict? It'll all come down to the price, which Samsung's keeping schtum about until September. The iPhone 6 will be launched in just over two weeks' time, and that means we're seeing more leaks than a Welsh greengrocer. Keeping our news and rumour round-up up-to-date has become a full-time job, and the latest leak suggests that we'll see a 128GB model at long last. While the iPhone 6 is sneaking out all over the place, the iWatch remains top secret - but that doesn't mean we can't divine Apple's plans from published information. A new patent suggests it'll have a sapphire screen and "jewelry" components. Maybe it'll look like Flavor Flav's clock. Last week we discovered how to build your own Steam Machine. This week, Joe Osborne explains how to build a fantastic gaming PC for considerably less cash than you might expect and without falling into the same traps he did. "Dude, this rig is sweet," he says. We hate to say we told you so, but we told you so: a few weeks ago Gary Marshall warned that Twitter was about to get a lot more spammy, and this week it happened. Tweets you mark as favourites will now be treated as retweets, and they'll pop up on your followers' timelines whether you want them to or not. Thanks, Twitter. Thanks a bunch. Steve Ballmer, Microsoft's inimitable former CEO, has severed his last tie with the company by stepping down from Microsoft's board to spend more time with his basketball team. If you think we'd use that news as a flimsy excuse to dig out the videos of his most demented sales pitches, his portrayal of Dr Evil and his infamous "Developers! Developers! Developers!" rant you'd… well, you'd be absolutely right. We'll miss you, Steve.